A stand-alone science fiction/ super villain comedy. Mollusk is from Neptune which means that he’s not a humanoid. He needs an exoskeleton to move around but he’s a genius, like many of his species. Unfortunately, he bores easily. His hobbies include inventing new technology and conquering worlds. He conquered Terra with mind control but ended up tinkering with their problems until he realized that his presence brought more harm than good to the poor planet. Then, he stepped down as the Warlord of Terra but the mind controlled Terrans stills practically worship him. Naturally, he has a lot of enemies outside of Terra. But to his surprise, one of Mollusk’s enemies wants to put him into a protective custody because assassins are after him. That enemy is Zala who is a commander in the Venusian guard and she has sworn to bring Mollusk to justice. However, now she’s been appointed as a bodyguard to Mollusk. Mollusk has no intention of staying put and waiting for others to find out what is going on. So, after surviving an attack, he does the reasonable thing and bribes the attacking mercenaries. However, they don’t know the customer but can point Mollusk and Zala to the right direction. The chase will take the unlikely duo through many exotic places on Terra, such as Atlantis and Dinosaur Island. The book is set in an alternate, comic book like world where every planet in the system has sentient life, such as Venusians, Saturnites, and Neptunians. Even the Moon has it’s own habitants. Terra has the mole people in addition to the Terra sapiens. All of them have spacefaring technology and other high-level tech. Atlantis is also above water and is famous for their mercenaries. There are also tantalizing hints about earlier alternate history where DaVinci knew the secrets of space travel and the Eiffel tower is a weapon against space invaders. Mollusk is arrogant and convinced of his intellectual superiority. However, he learns form his mistakes and is always eager to learn something new. He can’t resist new technology. He’s fun and a funny narrator. Zala is the opposite. She’s the arch type of a honorable warrior but she’s also very set in her ways and not open to new ideas. She follows orders rigidly. She and Mollusk have a few fun discussions about honor and other things. Both of them are fun characters but my favorite was Snog, Mollusk’s pet ultrapede, a fierce cybernetically enhanced giant centipede. She’s a great warrior but just as affectionate with Mollusk as any dog. The plot has two basic levels. In addition to Mollusk following clues to the person who is trying to kill him, there are flashback to his history; how he took over Terra and what he did during his reign. I really enjoyed this book and I’m going to try another of Martinez’s books soon. Today, the topic of Top 5 Sundays at Larissa’s Bookish Life is Best TV/Movie Sidekicks. I tend to have as soft spot for side characters so I have a lot of these. Jack was always dragging Mac into trouble with his crazy schemes. They are a varied bunch and I like them all. Delenn’s assistant was unquestioningly loyal to her. The thirteenth book in the historical mystery series. Phryne’s sister Elizabeth has come to visit. However, the old Beth has become very much a young lady and she disapproves of pretty much everything in Phryne’s life. Phryne suspects that something is wrong in Eliza’s life and she’s trying to give her sister room so that she will tell it on her own time. Phryne takes her whole family to the local amusement park Luna Park. After a couple of diversions, they go to the Ghost Train but end up finding a real corpse. It’s an old and mummified man with a bullet hole in his head. The police aren’t really interested in find out what happened to him so it’s up to Phyrne and her adoptive daughters to solve his murder. Meanwhile, Phryne’s Chinese lover Lin Chung is having a difficult time. Chung’s grandmother has supposedly handed over the Lin family to her grandson. Unfortunately, she still has a lot of influence and she disapproves of everything Chung does. She even forbids Chung to meet with the head of the Hun family. The Lins and the Huns have been in a feud for decades and Chung is trying to end that. However, with Phryne’s help, Chung is able to arrange a meeting and end the feud. But the end of the feud starts a mystery: about 80 years ago a group of Lin men in Castlemain carrying gold were supposedly murdered by Hun men who took the gold. The bodies were never found. But now Chung finds out that the Hun were not responsible after all and he has to travel to Castlemain himself and find out just what happened. I enjoyed both plots but I was really interested in history of the Lin family and the Chinese emigrants in general. Chung has to talk to a lot of venerable Chinese to find out what has happened to his relatives. The old people tell their stories which are often sad and horrible because they have been treated awfully by the local white people. Each chapter also starts with a letter from a Lin immigrant to his family in China. He was supposed to become a scholar but failed his test so he ran away to Australia in order to find gold and return with it back home. The familiar, delightful cast returns. Another great Phryne Fisher mystery. Reach continues the tale of the humans and the alien Tofa who live on the planet Tofarn. I would recommend reading Twin-Bred first because Reach only gives the bare bones of the characters and their situation. Spoilers for the end of Twin-Bred, obviously. The Twin-Bred are the result of the LEVI project which Dr. Mara Cadell created so that the humans and the alien Tofa could better understand each other. Her idea was to produce human/Tofa twins in host mothers. The resulting twins were raised in the project grounds, away from the other societies. The Tofa don’t have facial features, so it very difficult for humans to understand them. They also have four arms and are taller than humans. They don’t have biological (or social) sexes and reproduce with spores. Yup, wonderfully alien. At the end of Twin-Bred, almost all of the twins involved in the Project chose to leave the increasingly hostile planet on a space ship. A handful of humans left with them; they had all been teachers in the project. Only one Tofa/human twin set, Jak-rad and Randy, chose to stay on Tofarn because they wanted to explore their own cultures. The starship Star Seed was launched to seek a new home among the stars. However, all of the passengers knew that the journey would be long and most of the crew where put in suspended animation in a rotating basis. They also have virtual reality chambers for a variety of uses. However, then their main astronomer makes a discovery: a stable wormhole which could leave to alien planets. Meanwhile, back in Tofarn Jak-rad has been imprisoned by the other Tofa who see him (the Tofa don’t have biological sexes but Wyle uses the male pronoun) as a danger to their society. After two weeks, Jak-rad is released on the condition that he will work for the Tofa. Jak-rad is pleased to do so and is sent to a university which monitors reports from Star Seed. Before Star Seed left, Mara and a couple of others made a horrific discovery; that one of the scientist in the project was looking for a biological weapon against the Tofa. Mara decided to destroy that knowledge but it’s possible that the knowledge could fall into wrong hands and a couple of former host mothers have to make sure that doesn’t happen. Twin-Bred was very much an idea science fiction and not an adventure story. It explored the themes of understanding and yet on the other hand, hatred and ignorance. Rearch is also not an adventure story but in addition to continuing the themes of Twin-Bred, it also has a lot of exploration of space and culture clashes. Both don’t have much violence but when they do, it’s sudden and leaves a lasting impression. Reach has many point-of-view characters, but not as many as Twin-Bred had and they are also familiar from the previous book. On Star Seed, Mara is the main POV character with occasional glimpses of the others. On Tofarn, Jak-rad and the host mother Veda are the main POV characters. Most of the characters are quite sympathetic and it’s easy to empathies even with the alien Jak-rad. Mara is a great lead character: a reluctant leader whom the others look up to and then she has to make the difficult decision and live with them. Veda has a lot of secrets to hide while trying to raise a young daughter. Judy was another characters whom I enjoyed: her Tofa twin died in the previous book and she’s trying to cope without him. However, it turns out that something of her twin survived. I especially enjoyed the second half of the book but saying more about it would be a spoiler. Today, the topic of Top 5 Sundays at Larissa’s Bookish Life is Best Bookish Side Couples. Their romance starts in “Barrayar”. They are a mild-mannered couple who seem very well suited to each other. Another down-to-earth and sensible couple. 4, Pretty much every couple in the Elfquest comic book. They are just awesome! Redlance and Nightfall, Moonshade and Strongbow, and all the rest. 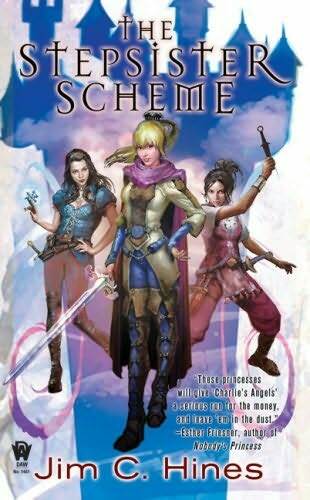 The first book in a fantasy series about reimagined fairy tale princesses. Princess Danielle is Cinderella. She married her prince with the help of her dead mother and despite the obstacles created by her cruel stepmother and her two daughters. She’s had a wonderful couple of months with her prince Armand and now she’s expected to learn everything a proper princess does. However, one of her stepsisters, Charlotte, tries to kill her and even gloats that she and her sister have kidnapped Armand. One of Danielle’s maids helps her against Charlotte who escapes with the help of magic. The maid Talia turns out to be Sleeping Beauty. She and her fellow princess Snow White are secret agents for Armand’s mother, Queen Beatrice. Danielle wants to rescue Armand and reluctantly Beatrice sends her with Snow and Talia to track down the prince. The trail will take them to Danielle’s former house and then to fairy lands. I liked the book a lot but for some reason, I didn’t really click with the writing. I also didn’t really care for the second half of the book where our heroine is rendered helpless. However, she does essentially get herself out of the trouble so that’s a big plus. The book has lot of humor, too, but unfortunately, some of it wasn’t to my taste. Each of the princesses have a personality and specialty of her own. They back stories aren’t the Disney versions but the darker, older versions. Danielle is sweet, trusting, and caring. She loves animals and has a way to communicate with them, but she doesn’t command them. She’s also been a servant for a long time and she’s still struggling to get out of a servant’s way of thinking. Talia has a grim history which we don’t find out until later in the book. She doesn’t trust others easily and she loathes faeries. She also constantly challenges Danielle because of Danielle’s inexperience. Talia is an expert swords woman partly because one of her gifts from the fairies is perfect grace. Snow is a balance between the two, she’s mostly friendly to Danielle and the others. She’s also more sexual and often flirts with men. She likes to draw attention to herself. She’s also a sorceress and used mirror magic. I really enjoyed the fairy land. Hines used a lot of material from different fairy tales and made them work together beautifully. For example, you shouldn’t accept deals or favors because fairies always ask something awful in return, usually your first born child. Fairies also stick to the wording of a agreement and not to the spirit. And the glass sword was awesome! The next book in the series is the Mermaid’s Madness and I will listen to that, too, at some point. The first chapter is available for free on Hines’ site. The first book in a new fantasy series set in modern US. I enjoyed Caine’s Weather Warden series and so I was eager to try her new series even though I’m not a zombie fan. Bryn Davies is a former soldier and now she’s a mortician. She’s just been hired as a funeral director to Fairview Mortuary, which has a reputation for going through funeral directors quickly. Bryn soon finds out why. Even though her immediate boss, Mr. Fairview, is nice enough, Bryn realizes that he sells drugs. And not just ordinary ones, but the one drug which will restore life to a corpse. Soon after, the villainous Fairview kills her. However, Bryn is revived with a shot of the drug, Returne. The two men who brought her back work for Pharmadene, the company which developed the drug and they want it back. They decide to use Bryn as a way to track down the black market seller. Because Bryn now need a shot of the drug every day, she has no choice but to agree. Bryn is very different from Joanne, who is the lead in the Weather Warden series. Bryn is a serious woman and she’s also quiet and contemplative, unlike Joanne. Unfortunately, this makes her somewhat flat and the other characters aren’t remarkable, either. Her situation is also so grim that there’s not a lot of humor in book. The leader of Pharmadene is a ruthless woman and she makes clear that as soon as Bryn isn’t useful to her, Bryn won’t get the drug anymore. Returne is based on nanotechnology. In addition to restoring a corpse to what it was during live (needing to eat, breath, having same emotions etc.) it also sets up a code word in Bryn’s system (and the systems of everyone else who has been injected with the drug) and when that word is said, Bryn has to obey. The book has a very dark tone; Bryn is dead and nothing is going to make her alive again. She can’t have a normal life. Even her romantic interest McCallister is cold and aloof. I wasn’t interested in him at all and couldn’t see what Bryn sees in him, except that he’s the only eligible man around. I would have liked the book more without the mandatory romance. The book doesn’t end in a cliffhanger but it does leave the future open for further adventures. At any case, Bryn has to have Returne or she will literally decompose. It wasn’t bad but I don’t think I’ll continue with this series.